Usage is simply. Create a SpeechSynthesisUtterance object with the text to convert and then pass the object to the speechSynthesis.speak() method. For this blog post I wanted to try something different and, instead of using the built in API, I wanted to use a Google service: Google Cloud Text-to-Speech. This service was made public available in August 2018 and complemented the already existing Speech-to-text service (see my previous blog post). These limits should be more than enough for experiments with the service without any cost. Like most Google services you need to authenticate a call to the service. For that you first need to create a Google account (if you don't already have one) then go to the API Console, create a project and add the Cloud Text-to-Speech API to the project. Next you have to create a Service Account Key in the Credentials menu. Select the Key type JSON and download the file. We can't directly call the service from the browser, although technically possible, it would expose the service account to the world and you have to keep this information secret. Also, make sure that you don't accidently commit this file to a public repository. To access the service we create a Spring Boot application that exposes a http post endpoint. This endpoint receives the request from our web application, sends the text to Google, waits for the response and returns the sound file to the browser. In the controller we inject the configuration bean, read the service account file and create an instance of TextToSpeechClient. This object is the access point to the Google service. Next we implement the POST endpoint that receives the request from our web application with the written text, sends it to Google, receives back a sound file and sends it to the web application. The code creates the request, configures the text, pitch, speak rate and encoding, then sends the request to Google with the textToSpeechClient instance we created in the constructor. The response contains the audio file as byte array that the service returns to the caller. The Google service supports Linear PCM, Opus and MP3 as output format. In this example we use MP3, which all browsers support. The client is an Angular 6 / Ionic 4 web application. 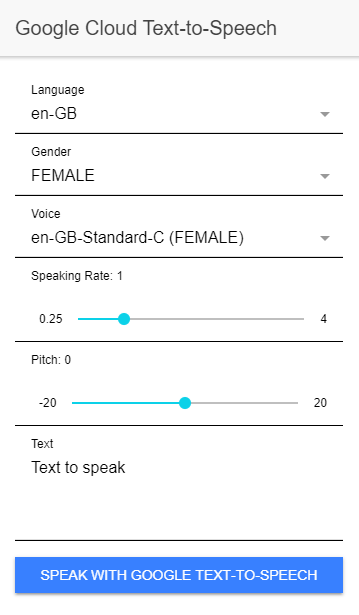 The application consist of just one page where the user can enter the pitch, speaking rate, select the voice and language and enter the text to speech. In the constructor of the page the application first calls the loadVoices() method which sends a request to the /voices endpoint of our Spring Boot server and then populates the select elements with the supported voices. When the user enters a text and clicks "Speak with Google Text-to-Speech" the speakWithGoogle() method is called. This method first creates a FormData object with all the necessary information and then sends it with a POST request to our server. When the call was successful, the application receives a MP3 file and plays it with the AudioContext API. This is all you need, start the Spring Boot server, start the web application with ionic serve and then you can play with the different input parameters. According to Google, the WaveNet voices are powered by the machine learning project DeepMind and should sound more natural than the standard voices. Note that the WaveNet voices are also more expensive and only 1 million characters each month are free.